The massage rooms at the Tea House are sky-lit, warm and inviting. 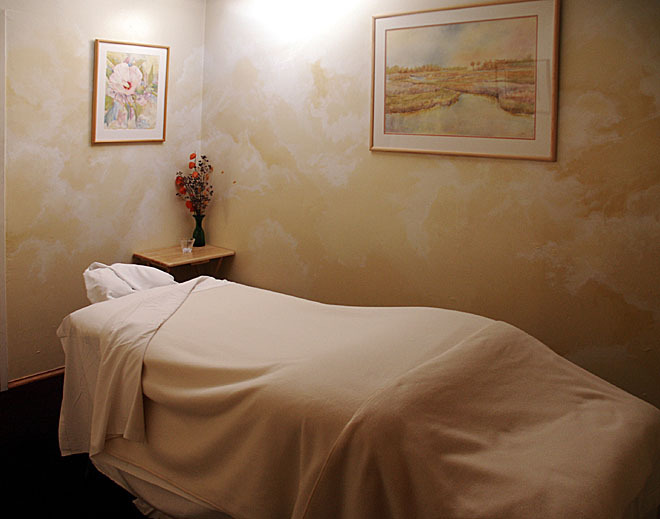 We are indebted to a diverse and experienced staff of professional massage therapists. Massage modalities range from relaxing Swedish to therapeutic body work to energy work or a combination. If you have a specific request, please let us know when making your reservation. To book a same day massage please call us at (831) 426-9700. Online massage booking must be made at least one day in advance. Massage is available by appointment from 11am to 10pm daily. Please call us at (831) 426-9700 to make your reservation. Please note approximately 5 minutes of the listed massage time will be for check-in with your massage therapist and pre/post dressing time. Each person will receive a therapeutic massage session in a private one person massage room. The spa room will be shared for two. To book the Gemini Package, please call us at (831) 426-9700. This offer is not available online.